Here is the final card for the other "F. Robinson" (#404). Floyd Robinson was a starting outfielder for the White Sox in the early-to-mid 1960s. He's also a cousin of Tommie Reynolds (an outfielder for the Athletics and Mets in the mid-1960s). Robinson began his career playing for unaffiliated teams in the low minors in 1954 and 1955. In each of those seasons, he made brief appearances with the unaffiliated San Diego Padres of the Pacific Coast League. In 1956 San Diego became an affiliate of the Cleveland Indians, so Robinson's contract was acquired by the Indians. 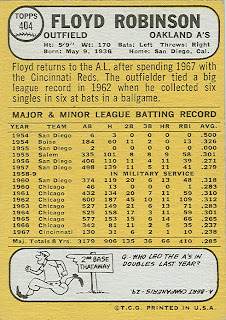 After 2 full seasons with San Diego, Floyd missed the 1958 and 1959 seasons due to military service. In 1959, Robinson (and in fact, the entire San Diego team) was acquired by the White Sox. After one more season in the minors, Floyd made his major-league debut with the White Sox on August 10, 1960. Chicago's outfield in 1960 consisted of Minnie Minoso in left, Jim Landis in center, and Al Smith in right. Robinson started the final 11 games of the season in right field. In 1961, Floyd took over the right field job, making 102 starts (to Smith's 55) and finishing 3rd in the Rookie of the Year voting. In 1962, he alternated between left field (84 starts) and right field (70 starts). From 1962 to 1965, Robinson was a workhorse in the White Sox' outfield, making more than 600 plate appearances each season. His 45 doubles in 1962 were tops in the AL. In 1963, the Sox acquired Dave Nicholson from the Orioles to play left field, so it was back to right field for Robinson, starting 117 games there and 16 in left. 1964 was more of the same (regular right fielder, primary backup in left) for Robinson. 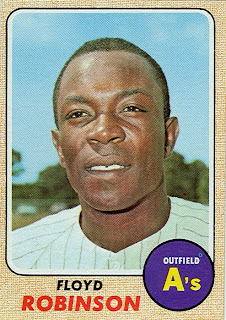 After starting 138 games in right field during 1965, Robinson's playing time fell off in 1966, as he made only 87 starts there. After the 1966 season, he was traded to the Reds for pitcher Jim O'Toole. Floyd's time in the NL only lasted 1 season, as he was shipped to the Athletics for pitcher Ron Tompkins. After a short time with the A's, Floyd was sold to the Red Sox on July 31st. He was released after the season, ending his 9-year career. Turns out he was born in the town where I now reside: Prescott, AR! Wahoo! My son went to Prescott College for 1 year (2010-11, I think).